The corruption in Washington 1939, as described by Capra, seems quaint by today’s standards. Instead of a local bully funding a dam for his own enrichment, we have a right leaning Supreme Court dramatically expanding the power of multinational corporations to influence our elections. As if in celebration of the Citizens United v. Federal Election Commission decision, Rupert Murdoch’s News Corporation gave the business friendly Republican Governor’s Association $1,000,000, and health insurance giant Wellpoint. Inc. followed with a more modest $500,000. In today’s world, Capra’s idea of a lone individual making a difference in Washington against powerful corporations such as News Corp and Wellpoint and their swarms lobbyists seems laughable. But, in these cynical and difficult times, his film bears a second look. The governor of a state has to pick a replacement for a recently deceased U.S. Senator. He chooses Jefferson Smith, a naïve and idealistic scout leader, who would be easy for the political machine to manipulate. In order to save his Public Works bill, Paine wrongly accuses Smith of corruption. Smith, naïve to the ways of Washington is blindsided. But with the help of his smart secretary, he takes the Senate floor and filibusters the assembled senators for 24 hours on ethics and American ideals. Payne, overcome by guilt, leaves the chamber and tries unsuccessfully to kill himself. Then he bursts back into the Senate chamber and confesses to his graft scheme, and declares Smith’s innocence. Smith’s filibuster (and the tacit encouragement of the Senate President) reflects Capra’s belief in the difference that one individual can make. Seems the film hit a nerve . . .
Mr. Smith Goes to Washington premiered in Washington, D.C., on October 17, 1939. Immediately, the Washington press and members of Congress attacked it as anti-American and pro-Communist for its portrayal of corruption in the American government. Joseph P. Kennedy, Ambassador to Great Britain, fearing the film would damage America’s image in Europe, urged that it be withdrawn from European release. The film, which celebrated speaking truth to power, ended up being banned in Nazi Germany, Fascist Italy, Soviet Russia and Falangist Spain. In 1942, a ban was imposed on American films in German occupied France. 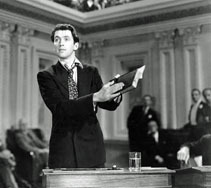 Some theaters chose to show Mr. Smith Goes to Washington non-stop as the last movie before the ban went into effect. In Capra’s movie, the naive idealist Jefferson Smith revered Abraham Lincoln, the Constitution, and the Declaration of Independence. Having idealized government from afar, he was devastated to discover the Senate was influenced by graft and greed. But, instead of giving up and going back to his small town life, he stayed and fought back. Capra believed that individual actions matter, a theme he continued to explore in It’s a Wonderful Life. Mr. Smith Goes to Washington has a lot to say to voters and candidates who desperately want to restore a healthy democracy in America, but feel overwhelmed at the amount of corruption at all levels of our political process. In the film, the character Jefferson Smith learned from his father, a journalist who was murdered for reporting the truth, that fighting for “lost causes” is one of the most important things one can do in life. In the film, Smith fights what seems to be a lost cause—undoing the corrupting influence of money in Washington. Only, in Capra’s world, he succeeds! promises to weaken the recent United Citizens Supreme Court decision through legislation, or overturn it through constitutional means. works to dramatically reduce the influence of lobbyists in Congress by banning lobbyists from writing legislation, and by banning congressional staffers, Senators or Congresspersons from taking lobbying positions for five years after they leave office.